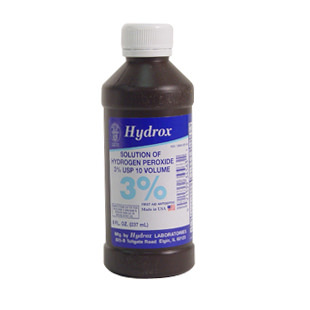 Hydrogen Peroxide is an active agent material composed of nothing more than water and oxygen. The oxidation process of this material is incredibly good at killing disease organisms, and HP is considered one of the world's safest, all natural, sanitizer. It literally 'burns' micro-organisms by oxidation. However, this material has so many other uses, it was really hard to pick only the best, most useful ones to share with you. So I've done my best to highlight some of the nifty things you can do with it. Tip: Make sure to only use the 3% solution for most of these items, and do not use it for internal purpose (do not swallow). Higher strength solutions such as 30% may cause damage if ingested. By adding a cup of HP to the white clothes in your laundry, you will see a marked improvement in how white they are. This is a great way of getting rid of really insistent stains such as blood or wine. For blood, just pour directly on the spot, wait a minute, and then rub and rinse under cold water. Your body makes its own HP to battle infections. Our white blood cells, also known as Leukocytes, are the cells responsible for fighting disease, viruses and infections, and some of them produce HP as their first form of attack and defense from toxins, infections, viruses, parasites and alike. Take 2 quarts of 3% HP and pour them into a tub of warm water. Get in and enjoy a good soak for about 30 minutes, adding hot water as needed. This will help skin blemishes, detox your body and rejuvenate you in a way you haven't felt before. To use HP to cure your foot fungus, make a mixture of 50% HP and 50% water, and use a spray bottle to spray the infected area (especially the toes) every night. Let it dry naturally. Using 2 caps or about 2 table spoons of 3% HP, add the HP to warm, distilled water once or twice a week and use it to treat the problematic area. There are many tools we use that need to be kept clean and sanitized, such as your tooth brush, or your children's retainer. Use a small amount of HP and dilute it with cold water to make a cleansing brew that will make sure they are clean and germ free. If you have a cut that got infected, soak it in 3% HP for about 5-10 minutes, several times a day. HP is extremely good for treating infections, and you can also pour half a bottle of it in your bath to get rid of fungus, boils or any other skin infections. Note: Do not leave on open wounds for a long time, use the solution and then wipe it off. Over time, HP can do tissue damage to open wounds if left on them too long. Patients have reported that spraying HP on skin infected by tiny mites that bite and cause irritation, effectively kills them with incredible efficiency. Spray the area a few times, and wait a few minutes between applications. Add a tablespoon of 3% HP to 1 cup of (non chlorinated) water, and use it as a nasal spray. You may have to adjust the amount of HP used according to the severity of the problem. Start with just the 1 spoon first. Take a capful or a tablespoon of 3% HP and hold it in your mouth for 10 minutes, once a day. Do not swallow, just spit it out. This will not only get rid and prevent canker sores, but will also whiten your teeth. It will also help in the event of a bad toothache you can't treat right away. 10 minutes several times a day will lessen the pain to a more manageable level. It also makes for a great and inexpensive mouth wash. Again, make sure not to swallow and rinse your mouth with regular water after use. HP is a bleaching agent, of course, and can be used to lighten your hair. Take a bottle of 3% HP and dilute some with water (50/50). Then take a shower and, while the hair is still wet, spray it with the solution, then comb it through. It won't look like a burnt blonde color, but a more natural highlight for those with light brown, reddish or dirty blond hair. It is also a gradual change so you won't have a drastic new look on your hands. As a great disinfectant due to its remarkable skill in breaking down the proteins that build up on the lens, HP will not only clean your lens but will also increase your level of comfort if you have sensitive eyes, removing those little biological irritants that most solutions don't clean. Add about 2 oz. (60 ml) of 3% HP to your regular formula, and see how much whiter and cleaner the dishes are. Fill a spray bottle with the 50/50 solution we've talked about (50% water 50% HP) and use it to spray your wooden cutting boards and cooking areas after you are done, to kill salmonella or any other bacteria that might be growing there. To be extra sure, use vinegar after the HP. Make a cheap and very effective disinfectant agent that is non-toxic and can be used to disinfect fruits, vegetables, pet bowls, equipment and alike. Combining vinegar and HP has been proven in several studies to kill pretty much all Salmonella, Shigella, and E. coli bacteria. For this, prepare TWO spray bottles. Don't mix these two together. One will contain regular vinegar and the other regular Hydrogen peroxide. 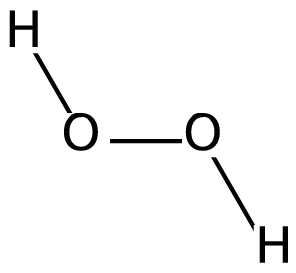 (tip: Light is bad for peroxide, rending it inactive. So the best thing will be to keep it covered and in the bottle). If you have those little spots appearing on your walls, probably from water damage, taking care of them is better done sooner than later, or they can get toxic and dangerous. Clean them with HP a few times a day to kill them off. If you're trying to get a seed to grow stronger, add an ounce (30 ml) of 3% HP to 1 pint of water and let the seeds soak in it overnight. Every time you rinse the seeds, add the same amount of HP. They will grow faster and healthier. Wash or soak vegetables in a full sink of cold water mixed with a 1/4 cup of 3% HP. Light skinned vegetables (such as ligh lettuce) should soak for about 20 minutes, while thicker skinned ones (such as cucumbers) can soak for about 30 minutes. Then drain, dry and refregerate. This will not only kill all bacteria and neutralize chemicals, but will also make sure they keep fresh refrigerated for longer.